Add comfort, warmth, and style to your bedding with our Me Sooo Comfy Blanket in Rose Quartz. 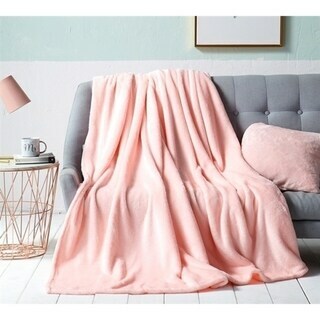 This soft pink blanket is made of coral fleece with a 250 GSM fabric weight. This supersoft blanket is available in several sizes to ensure you can find the one that's right for you. Adore this blanket!!! Softest blanket ever & such a pretty pink color! Like a soft, warm cloud. I love everything about this blanket, from the gorgeous rose quartz color, to the size, and of course the feel. It took a while for it to be sent, but once shipped it got here in 2 days. It was shipped in it's bag with another bag tightly on top of it and the label was attached to this bag. It got here without any splits or tears. I haven't washed the blanket yet so I'm not sure how it will wash. I do expect it to wash easily without too much lint, based on the way it's made and the way it feels. I do recommend this blanket to everyone. In fact, my sister is visiting and she wants to steal my blanket. I wouldn't allow that so I did the next best thing, I got her on Overstocks website and had her buy her own. This blanket is so soft and I love the color. I'm using it as a bed spread. I would recommend this blanket to anyone. Nicely made and arrived as scheduled. It's incredibly soft. I am hoping the bedding becomes available again. It is such a soft and warm and cuddly blanket! It arrived in a reasonable amount of time and in perfect condition. I cannot wait for a cold and snowy night when I can snuggle up with this soft and fleecy blanket. Could also be used as a throw for those cool nights in front of the TV. I even take my own snuggly blanket with me when I travel. I highly recommend this purchase for yourself, for a wedding gift, birthday gift, holiday gift. Also, it was available in multi colors as well as different sizes. It is great for all ages as well. Whether you are decorating a child’s bedroom or an adult’s bedroom these blankets are perfect. One could buy different colors and layer them for a rainbow effect. Or, put them down on the floor for the kids when they are playing games in front of the fireplace. Price was fantastic as well! Really soft and comfy. Great product. This blanket is absolutely amazing, it’s so soft and comfortable. I ordered king size and it fit my bed perfectly, price was pretty good especially for the quality. This blanket is the prettiest shade of a pale, peachy pink, and it is very soft and cozy. Plush fabric is very good quality. Using it for teen girl’s bedroom. Highly recommend. I love my blanket and it was delivered so quickly. Thank you for great items at great prices. OMG this blanket is so silky and soft! I only wish it were a little thicker. Plan on using as a comforter in the warmer months. It would also be great to use while watching a movie. Super soft. Beautiful color. Mu granddaughter loves it! This is the warmest and softest blanket in the world! It’s light but it does the trick! The color is absolutely beautiful as well! I like that it keeps you warm, is so soft and looks so pretty! It’s a winner for sure! I have never felt a softer blanket. My granddaughters love to spend the night with me and now they want to lay in my bed and watch Disney Cartoons, They love "Grandmas Softest Blanket Ever"
Beautiful Blanket! Very soft and fluffy even after washing. Love the color and even though it's very warm and toasty it is not heavy so it's very comfortable to sleep with. I would definitely recommend and will buy again! "What’s the difference between casual and Victorian style on this blanket? All the pictures show the same blanket." There is no difference between these, "Casual" and "Victorian" are style categories used to sort items on the website and not specific descriptors of this item. We do apologize for the confusion. "What’s the difference between “casual” and “Victorian”? I van get Twin-XL in “casual” and F/Q/K in “Victorian” but none of the pictures show or describe either of them." The words casual and Victorian are used to classify the style of the blanket.